I’m not as familiar as I’d like to be with children’s poets and poetry (hey, that rhymes! ), but one of my favorites to date is Mary Ann Hoberman, a former U.S. Children’s Poet Laureate and the author of over 40 books. We have a number of her titles and I’ve turned to them regularly, and with great success, as a source of fun, lyrical material for my kids and students. Hoberman is remarkably deft with verse and her work is consistently clever and witty. If you’d like to add some splendid books of poetry to your home library—books that can be enjoyed by children and adults alike (and are particularly good for nurturing the language development of younger children)—I highly recommend the lively, lighthearted work of Mary Ann Hoberman. Hoberman’s work consists of both children’s stories told in verse as well as collections of shorter poems. 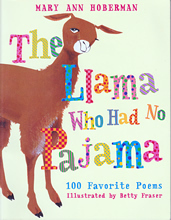 A nice collection is The Llama Who Had No Pajama, which includes 100 of her favorite poems. Her verse and wordplay are lovely—and have been a hit with my kids—but I can’t say I’m as enthusiastic about the illustrations for this book. 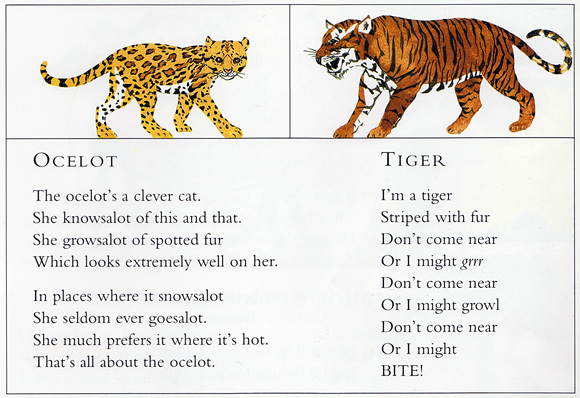 To me, the poems, which are often zestfully silly, would have been better served by a more quirky, contemporary style of illustration. Still, it’s a really fine book of poetry. 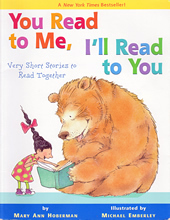 In her bestselling series You Read to Me, I’ll Read to You, Hoberman is teamed with the playful illustrator Michael Emberly and I find his artistic style a much better match for her sensibility. These books, which are dialogues in verse and designed to be read by two voices (you and a child, or even siblings), are terrific resources for promoting literacy development in a fun, cooperative way. We own three of the five books and I’ve used them often with both my kids and my students. 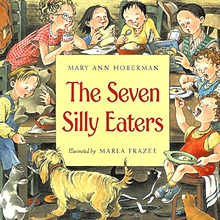 Among her many children’s stories told in verse, The Seven Silly Eaters is no doubt one of the best examples of her gifts as a poet and humorist. It’s a comic romp, involving family, food, and farce, and as much fun for parents to read as it is for children to hear. Other winning titles we’ve enjoyed are One of Each (an ode to friendship) and And to Think That We Thought That We’d Never Be Friends (a paean to peace). Browse the complete list of Mary Ann Hoberman’s work here, or pay a visit to her personal site (though it hasn’t been updated recently). And I am a you to you, too! Yet splits us each in two. Every I in the world is a you! Looking for more great books for bilingual kids? Head right here to find all my suggestions to date! How about you? Which children’s poets and books of poetry would you recommend? Next post: Should I Send My Child to an International School?